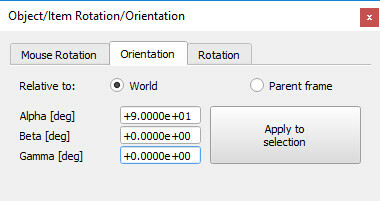 In this section of the dialog, rotation parameters of objects manipulated with the mouse can be set. See also the page on object movement via the mouse. Relative to world/parent frame/own frame: indicates that a mouse drag will rotate the selected object about an axis of the absolute reference frame, the parent object reference frame, or the object's own reference frame. 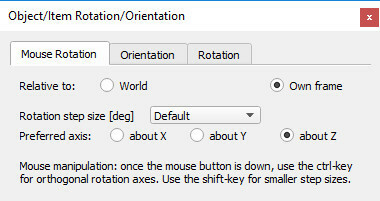 Rotation step size: the step size used when rotating the selected object with a mouse drag (see the user settings dialog for default step sizes). Smaller step sized can still be used during manipulation by pressing the shift-key after the mouse button was pressed down. Preferred axis: about X/ about Y/ about Z: indicates that a mouse drag allows rotating the selected object about a preferred axis of the reference frame selected above. Other axes can be used during manipulation by pressing the ctrl-key after the mouse button was pressed down. In this section of the dialog, setting a precise object orientation can be achieved. Relative to world/parent frame: indicates that the indicated Euler angles are relative to the absolute reference frame, or relative to the parent reference frame. Alpha / Beta / Gamma: Euler angles of the selected object relative to the indicated reference frame (world or parent). In this section of the dialog, precise object rotation can be achieved. Relative to world/parent frame/own frame: indicates that the rotation will be relative to the absolute reference frame, relative to the parent reference frame, or relative to the object's own reference frame. 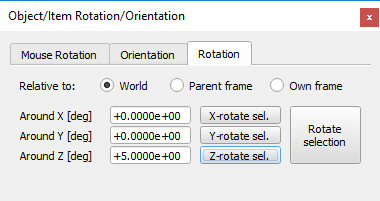 Rotate around X / Y / Z: indicates the desired rotation amounts around the x-, y- and z-axis of the indicated reference frame (world, parent or own frame).